UFC lightweight champion Conor McGregor surprised a lot of people with his performance against Floyd Mayweather last night in Las Vegas. “Mystic Mac” had a terrific few opening rounds before Mayweather was finally able to settle in and start finding his range. Ultimately, Floyd Mayweather would end up stopping the Irish superstar in round ten, this after landing a barrage of punches which forced the referee to step in. 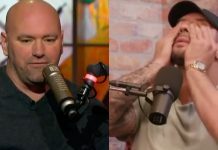 Following the thrilling main event, perennial UFC lightweight contender Nate Diaz got into it backstage with former UFC heavyweight fighter Brendan Schaub who was working as analyst for the Mayweather vs. McGregor bout. 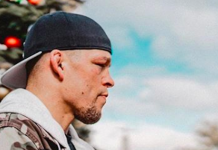 Nate Diaz was last seen in action at UFC 202 in August of 2016 where he suffered a controversial majority decision loss to the aforementioned Conor McGregor in their highly anticipated rematch. In their first encounter at UFC 196, Nate Diaz served Conor the first loss of his UFC career by way of submission. “The Stockton Slugger” is hoping to book a trilogy bout with “Mystic Mac” for later this year to finally settle the score.